At Bill’s Custom Concrete, we are specialists in all of your possible stained concrete projects in the Oklahoma City Metro area. The stained concrete process must be administered with painstakingly precise measures or the surface could become seriously damaged in short time. 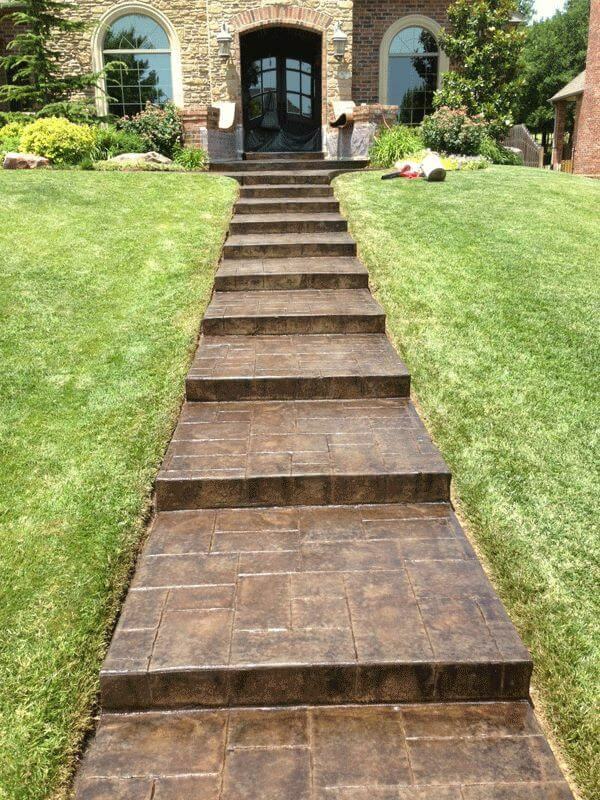 With 40 years of high quality custom concrete experience, the team at Bill’s Custom Concrete can transform that tired and worn concrete sidewalk, driveway, or patio, and create a stunning focal point on your property. A very important part of the stained concrete process is taking the time to carefully analyze the surface and take the precautions to ensure long-lasting results. Each customer has unique tastes and needs, and each stained concrete job completed by Bill’s Custom Concrete is a reflection of the goals of the customer, not just some cookie-cutter process that looks the same on every job site. Regardless if the stained concrete is being applied to old or new concrete, before the process can begin the ground must carefully be analyzed. This region of the country has some extreme droughts, floods, and freeze-thaw cycles. 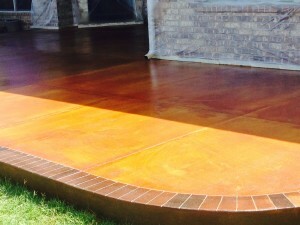 Our stained concrete specialists in Oklahoma City will create a unique solution to ensure the concrete doesn’t shift and crack, then implement the specific design that you have chosen for the surface. 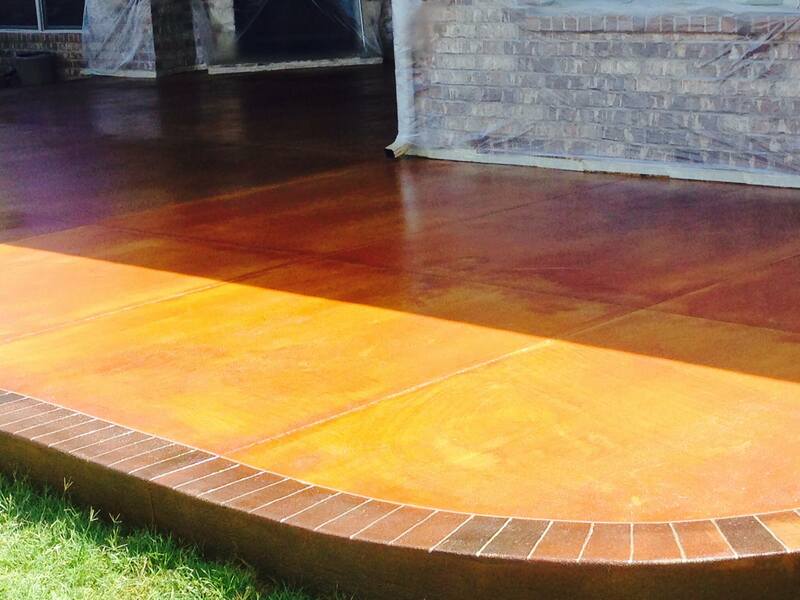 The stained concrete process we implement allows us to provide our customers the ability to choose from a wide array of colors. From English red, tan, or cola, you even have the ability to allow our team to mix colors that will closely match the color scheme of the outside of your home. There are many benefits to having the stained concrete finish applied, one in particular is this process gives the surface a mottled antiqued appearance. This makes the concrete surface blend easily with the surrounding area, especially in older homes. The surface will appear aged, but will be strong and durable enough to withstand the harsh weather conditions of the Oklahoma City area. The biggest advantage to the stained concrete procedure is that we can apply the process to brand new poured concrete or simply resurface an older driveway, patio or sidewalk. The staining process is perfect for that tired looking patio surface that still has a solid foundation but just needs a more modern appearance. Choose from a variety of patterns that will give the surface a completely brand new look. One of the reasons that Bill’s Custom Concrete continues to be the concrete company customers in this region call when they want a professional job completed, we take great pride in going that extra mile to ensure the finished product meets and then exceeds your expectations. The way we consistently do this is by taking the time to do those tedious steps many concrete companies will avoid during the job. First we understand the importance of thoroughly cleaning the concrete before beginning the process or the surface will simply resist the stain. We make certain to use high quality sealers on top of the stained concrete to bring out the vibrancy and protect both concrete and color. 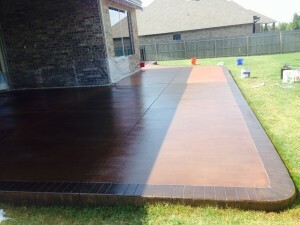 Our technicians in Oklahoma City are qualified stained concrete experts and we can perform this unique procedure on driveways, pool decks, patios, sidewalks and even floors. When you choose Bill’s Custom Concrete, you can rest assured knowing your stained concrete will look amazing and no damage will be done to the concrete by the staining process. Let our friendly concrete specialist show you how we can transform your tired and worn concrete surface today with a fantastic stained concrete project at your home! Specialists are available for a free consultation, simply call us at 405.755.3975 today for your next stained concrete project in the Oklahoma City Metro area.